When you first sign up for Accounting, your company will be created using the information that you enter in the signup process. You will then enter more details in the Company Settings screen. 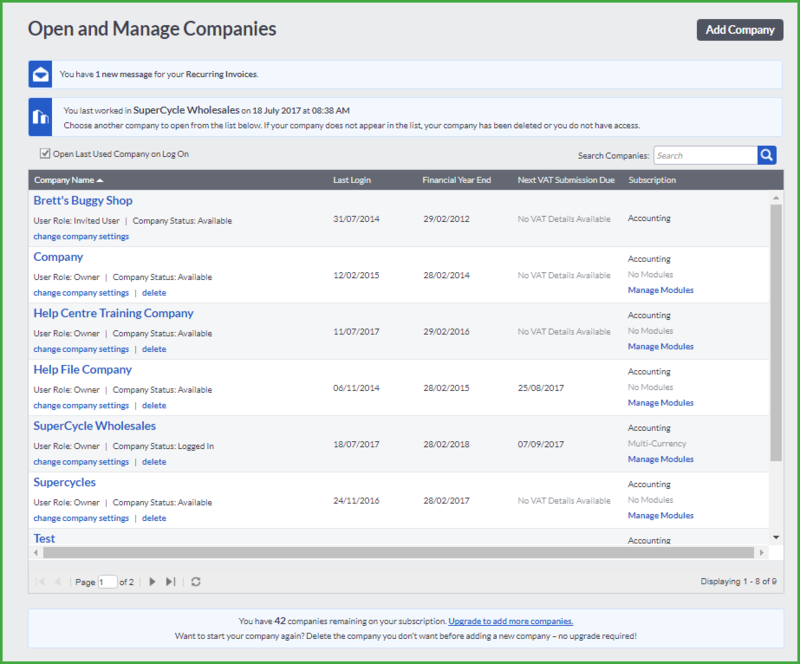 New companies are created from the Open and Manage Companies screen by clicking on the Add Company button. Enter your company name in this screen. Click on the Next button. Enter your company information in the Company Details screen. Click on the Next button. If your company logo must display on your documents, you can upload it in this screen. 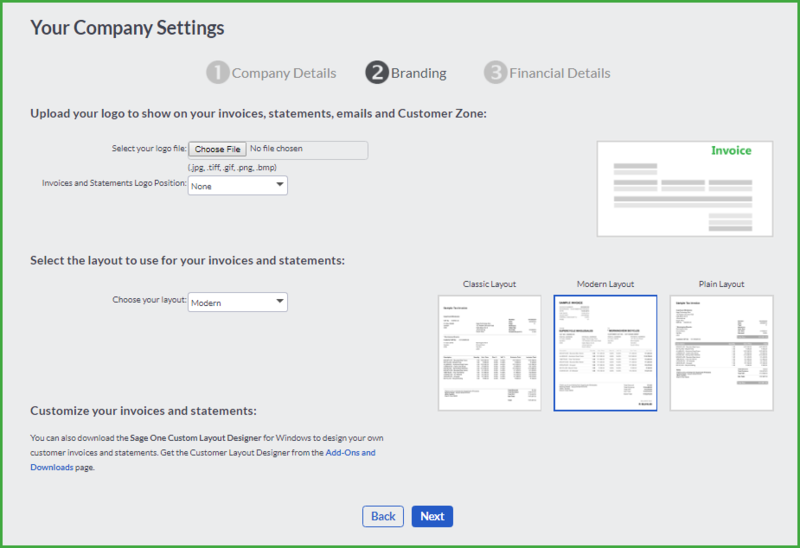 If you are allowing your customers to view invoices and quotes as well as their account history online, enable the Customer Zone options. Click on the Next button. 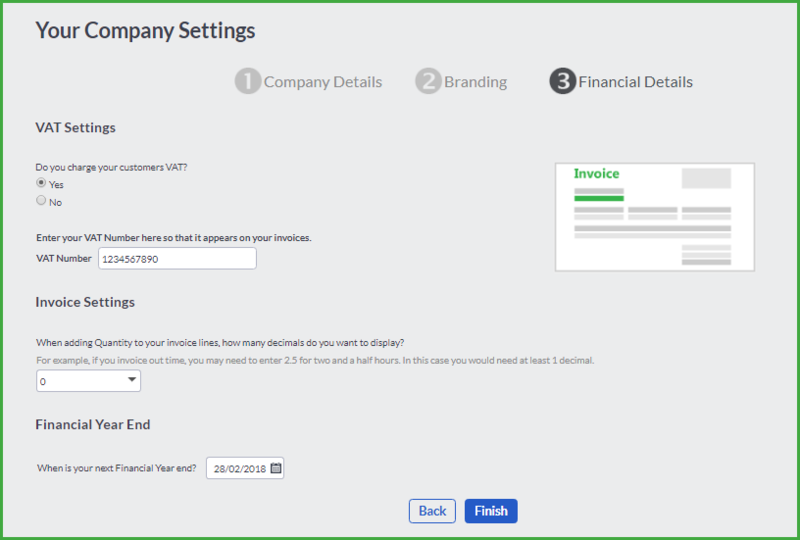 Select your financial year as well as your company’s VAT settings in the Financial Details screen. Click on the Finish button to create the company. Confirm if you want to log into this company. The checklist below will take you through the creation and setup of a company that has no past trading activities and, therefore, no opening balances. If you are setting up a company that has traded in the past, and you will be transferring data from another system, you will need to have a look at how to continue an existing company in Accounting. Accounting also has the option available to assist you to get your company started up by using the Opening Balances option. - Address and Statutory Information. - Upload a logo for use on documents. 3 Create your customers to sell items to. 4 Create your suppliers to buy items from. 5 Create your items to buy and sell. 6 Create accounts for each of your bank and credit card accounts. 7 Review the list of Accounts by deleting those that you are not likely to use and creating new accounts as you require. Your Accountant will be able to recommend changes based on the nature of your new business. *You may want to confirm these details with your Accountant. The checklist below will take you through the creation and setup of a company that has traded in the past, and you will be transferring data from another system. If you are setting up a company that has no past trading activities, and therefore, have no opening balances, you will need to look at creating a brand new company. Accounting also has the option available to assist you to get your company started up by using Opening Balances. 3 The next steps cover the creating of accounts with their existing balances. Please read the section titled Entering Opening Balances below. Create your customers to sell items to.You can also import your customer details. 4 Create your suppliers to buy items from. You can also import your supplier details. 5 Create your items to buy and sell. You can also import your item details. 7 Review the list of Accounts by deleting those that you are not likely to use and creating new accounts as you require. When taking on Opening Balances, it is important to ensure that all Opening Balances are captured as at the same date. It is easiest to take on balances as at the beginning of a Financial Year, but the steps below will also guide you through taking on balances at a date during the year. 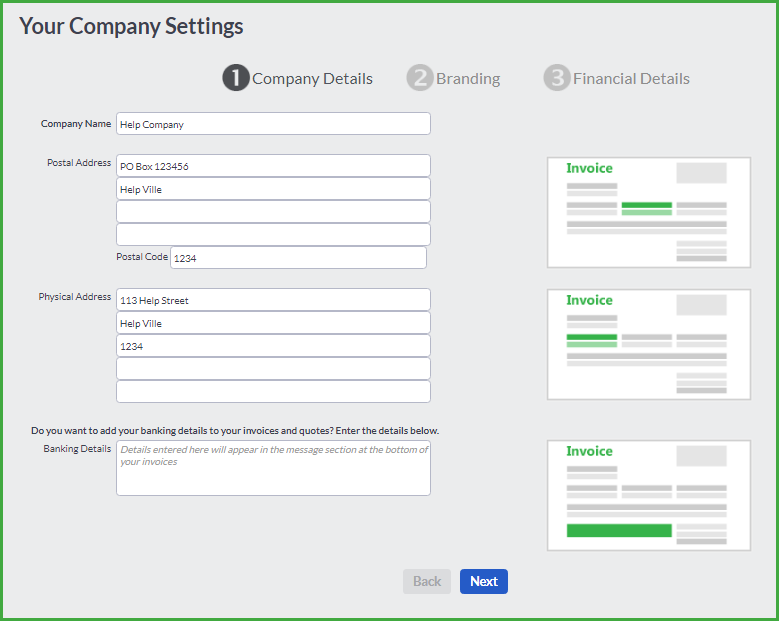 Accounting has the option available to assist you to enter your Opening Balances under the Company menu. Trade Receivables When you create or import Customers, you can include an Opening Balance amount and date. Trade Payables When you create or import Suppliers, you can include an Opening Balance amount and date. Items When you create or import Items, you can include an Opening Cost, Opening Quantity and an Opening Quantity As At date. Accounting does not maintain separate “subsidiary ledgers” for Customers, Suppliers and Items. Transactions involving these accounts are recorded individually and summarised on the relevant financial reports. For this reason, it is important to remember that Opening Balances captured against any of these accounts will automatically be included on the Statement of Assets and Liabilities. You do not need to create “control” Accounts for these accounts. Bank Accounts When you create Bank and Credit Card accounts, you can include an Opening Balance amount and date. Tax Payable To take on an opening balance on Tax, a Tax adjustment must be processed. If that Tax amount is Payable, process a Tax adjustment to increase Output Tax on the date of the Opening Balances. If you are due a Tax Refund, process a Tax adjustment to increase Input Tax on the date of the Opening Balances. Tax Provision Accounting will automatically calculate the value of your Tax Provision opening balance by calculating the tax portion of your Customer and Supplier Opening Balances at the default tax rate set for your company. Retained Income To take on a Retained Income balance, create a new account for Retained Income and allocate it to the Owners Equity account category. When you create the account you can enter an Opening Balance amount and date. All other assets, liabilities and owners equity accounts Create a new Account for each of your asset, liability or equity accounts. Ensure the appropriate Account Category is selected and enter the Opening Balance amount and date. NB: It is extremely important that the correct Account Category is used. Not only does the Account Category define where the Account will appear on the Financial Reports, it also defines how any transactions posted against the account are processed. If you are not certain of the Account Category, it is advisable to check with your accountant before creating the Account. If you have not traded in the current financial year, there will be no balances on any of the Income or Expense accounts. All past Income and Expenses will have been added up to make up the balance on your Retained Income account, described above. At this point, you can create all of the Income and Expense accounts that you may require in the future; alternatively, you can wait until you need an account, and create it then. If you are taking on balances at a point during the financial year, a few extra steps are necessary. Should you need full transactional history for the current financial year, that is, the ability to view each individual invoice, payment, receipt and so on, you would enter opening balances as at the beginning of the Financial Year (see above) and then re-process all transactions up to the current date. Clearly, this approach is not recommended if you have more than a handful of transactions to re-enter. If you do not need full transactional history you will enter Opening Balances on each Account as at the take-on date. Accounting maintains certain Income and Expense “system accounts” which are calculated for the Profit and Loss report based on processed transactions. These accounts are: Sales; Cost of Sales; Discount Received; Discount Allowed and Bad Debts. Because these system accounts are based on specific types of transactions, it is not possible to directly adjust them. Opening Balances for the system accounts must be captured against similar Accounts to ensure correct reporting. 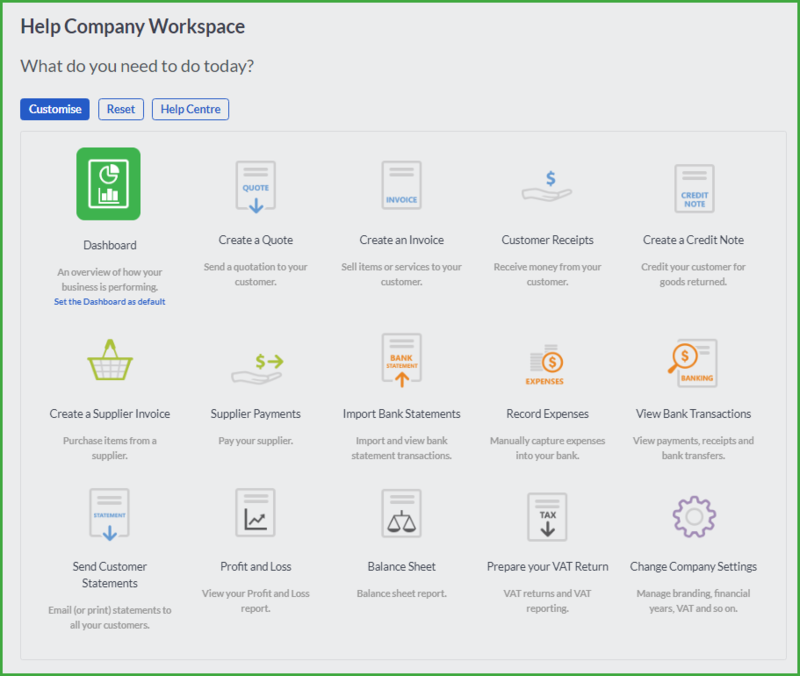 For example, to take on an opening balance for Sales, create a new Account called “Sales – Opening Balance” with the Account Category set to “Sales”. Enter the opening balance amount and date, and Save the new account. When viewing the Profit and Loss report, under the Sales heading there will be a line for “Sales” reflecting all sales recorded through invoicing customers. There will also be a second line for “Sales – Opening Balance” reflecting the opening balance amount as entered. 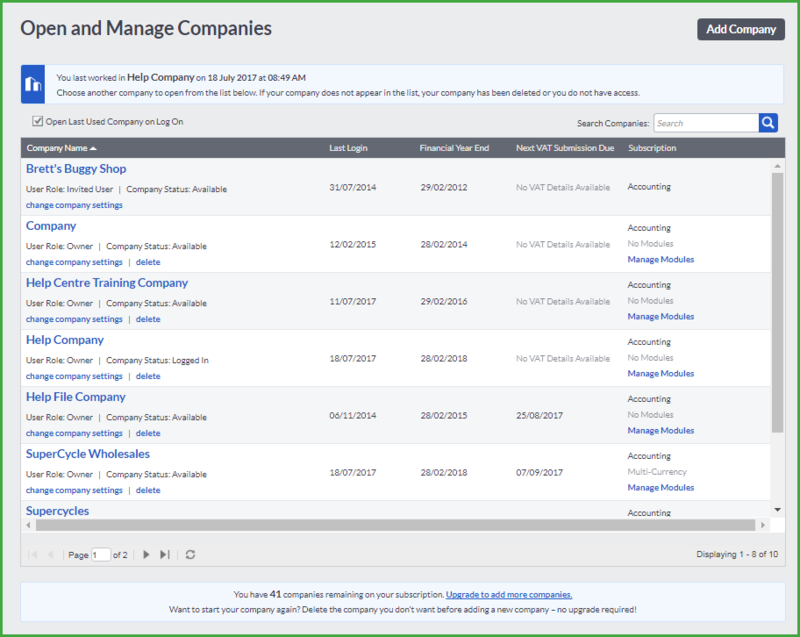 If you have more than one company, when you sign into Accounting, the Open a Company screen will display. From here, you can select the company that you want to open by clicking on the company. There is also an option to open the last used company the next time that you open Accounting. If you check the check box, the company that you were working in when you logged out of Accounting will open when you next sign in. The company will open on the Home page – the Dashboard. If you only have one company, your company will open on the main Company Dashboard. 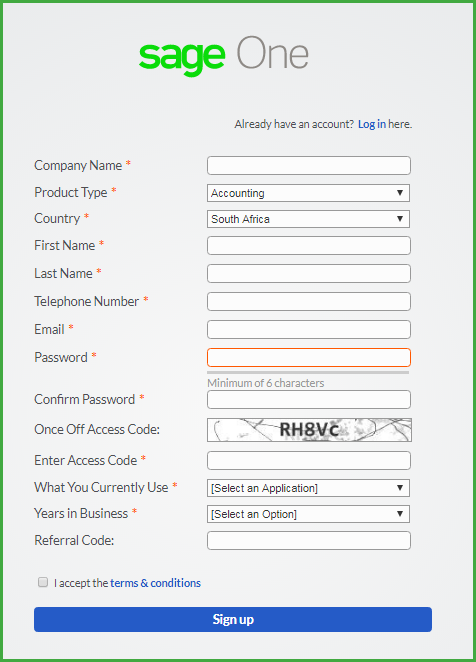 When logging into Accounting, you can log into the system as an accountant or as a user. The login screen is the same, but there are differences in the system which the accountant has that the normal user wont have. All these extra features will help the accountant process accountant information for the company. If you no longer need a company, you can delete it. If you select to delete a company, your company will not be deleted immediately. The company status will become “Pending Deletion” and an email will be sent to you from Accounting. In the mail, you will be advised that you cannot recover a company that has been deleted. You will also be provided with a link to confirm the company deletion. Once you have clicked on the link, the company will be deleted. If you delete a company, you will not be able to recover the company. Backups of deleted companies are not stored. Before you delete a company, you must ensure that you will not need that company at any point in the future.